You are looking at an EXTREMELY RARE commemorative medal of the reign of Tsar Nicholas I. 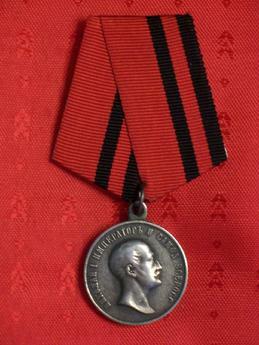 The Medal was first instituted following a decree published on June 25, 1896 by order of Tsar Nicholas II. It was created to commemorate the centenary of the birth of Tsar Nicholas II's great-grandfather, Tsar Nicholas I, who was born on June 25, 1796. The obverse of the silver medal bears the truncated bust of Tsar Nicholas I facing right encircled by an inscription meaning: "Nicholas I Emperor and Autocrat of All Russias". 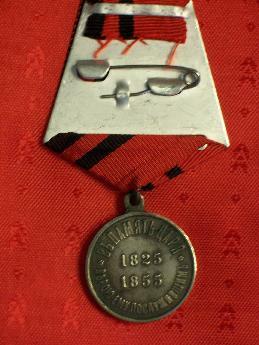 In the centre of field the reverse of the medal shows the dates: "1825 1855". with a circumscription signifying: "In memory of the Tsar For Serving Him Faithfully".